The Green Schoolyards America Principals’ Institute supports school administrators in their pivotal role as leaders of their school community and champions of a healthy and dynamic school environment. The Institute is a year-long program that provides resources, advice, professional development, and a peer network that helps principals and school district leaders to adopt and sustain comprehensive, high quality, green schoolyard programs at their schools and in their districts. We are currently accepting enrollments for the 2019 Bay Area cohort and the 2019-2020 Los Angeles Area cohort. Click below for more information, including dates and deadlines, and to register. QUARTERLY SEMINARS: The heart of the Principals’ Institute is a series of four professional development seminars that focus on discussion topics led by an expert in the field. Discussion topics will explore: international research and best practices; place-based education and environmental literacy; strategies to improve health and well-being using school grounds; and techniques to connect environmental principles and concepts taught in the curriculum with real improvements to a school’s ecological footprint. As the year progresses, participants will also select additional topics that we will address in our group discussions. INDEPENDENT PROJECTS: Each participant will identify a school ground-related independent project they wish to work on, and will develop that idea over the course of the program with input from the Institute’s staff and team members from their district. Each quarterly seminar will include time to develop ideas, share them, and receive feedback from peers and Institute staff. SCHOOLYARD TOURS: The Institute also includes four one-day tours of participants’ school grounds, held over the course of the year. The tours offer host-principals a chance to share their successes and challenges with their colleagues and to ask for advice about emerging projects. TEAM-BASED APPROACH: The Institute is designed to serve school district teams that include at least two school principals and one leader from the school district’s administration. This team-based model helps to build robust collaboration within each district and provides support for green schoolyard projects as they emerge. PERSONALIZED GUIDANCE: Green Schoolyards America’s staff will offer each district team one site visit during or after the first year of the program, to help participants advance their independent projects by deepening their school districts’ engagement with green schoolyard ideas, methods, and strategies. This district-level support will be tailored to serve each team’s needs and ongoing projects. It may include meetings, professional development for the school district’s administration, or a public presentation to provide training in green schoolyard best practices. RESOURCE LIBRARY: Our program will include the gift of a small, personal green schoolyard resource library for each participant. HANDS-ON SCHOOLYARD RESEARCH: Participants are also eligible to take part in Green Schoolyards America’s citizen science microclimate research project, How Cool is Your Schoolyard? The study will be accompanied by standards-based climate change and urban heat island curricula. REGIONAL NETWORK: The Principals’ Institute will include schools and districts from across the Bay Area, with a wide range of experiences and contexts. Participants will be encouraged to explore this diversity, get to know their colleagues, and learn from one another. Following the Institute, all participants are welcome to join our regional Green Schoolyard Leadership Network to continue dialogue with their peers. STAFF: The Principals’ Institute is led by Green Schoolyards America’s CEO, Sharon Danks, MLA-MCP, in collaboration with Principals’ Institute Program Director Dr. Raymond Isola, EdD (a retired elementary school principal), and Program Manager Erica Fine, EdM. 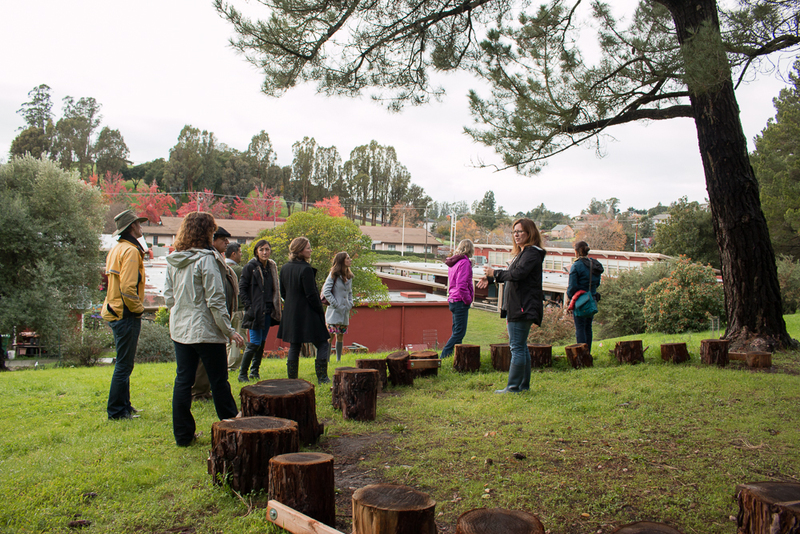 We are currently accepting enrollments for the 2019 Bay Area cohort of Green Schoolyards America’s Principals’ Institute, which will begin in March 2019. The quarterly professional development seminars will be held on March 8, May 3, September 27, and November 8, 2019 from 9:00 am to 2:30 pm in San Francisco and other rotating locations around the Bay Area. Green schoolyard tours meet from 9:00 am - 4:00 pm and will be scheduled after the program begins. Please click here for more information and to register. Download the Bay Area Program Brochure here. We are currently accepting enrollments for the 2019-2020 Los Angeles Area cohort of Green Schoolyards America’s Principals’ Institute, which will begin in September 2019. The quarterly professional development seminars will be held on September 20, 2019, November 22, 2019, January 31, 2020, and March 13, 2020 from 9:00 am to 2:30 pm at rotating locations around the greater Los Angeles area. Green schoolyard tours meet from 9:00 am - 4:00 pm and will be scheduled after the program begins. Please click here for more information and to register. Download the Los Angeles Area Program Brochure here. We extend a heartfelt thank you to our collaborating partners and generous sponsors who make our work possible!